Here’s a fun and interesting look at how Hollywood ages actors with make up and prosthetics versus what they actually look like when they get old. 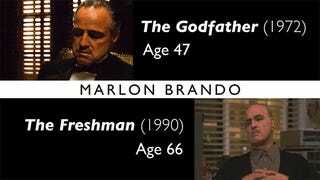 Some of the movies get it very close (Marlon Brando in The Godfather), while some movies are way too liberal with the wrinkles and the balding and end up getting it totally wrong (like Dustin Hoffman in Little Big Man and Biff in Back to the Future Part II). We all get old and we all carry our age in weird places that Hollywood make up doesn’t always get (like the neck). But sometimes, you get people who have aged much better in real life than they did on screen with make up. Hello Lea Thompson and Kyle MacLachlan. Check out the full video by Filminick below.